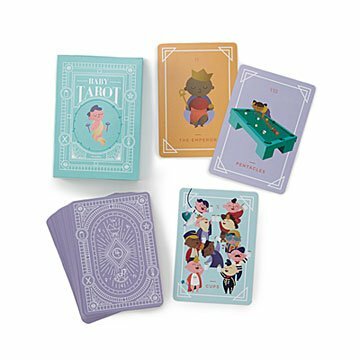 Traditional Tarot suits, illustrated adorably, help channel your intuition and tap into baby's future. Babies are all potential, no past—so they’re ideal subjects for Tarot readings. As a little one starts their journey through life, these cute cards channel your intuition to tap into their future. Adorable color illustrations bring a playful spirit to the archetypes and suits of the traditional 78 card deck: The Magician’s wand is a rattle, Cups turn into baby bottles, and Pentacles become wheels on a toy train. A source of inspiration and entertainment for new parents, it makes a fun and especially meaningful baby shower game. Includes a guide book to make tarot fun for the next generation. Written and designed in Maine. Illustrated in Argentina. Made in China. Includes a 48 page guidebook.